A section of the N3 Belturbet Bypass between Staghall Roundabout is now open to traffic. This section of road removes the heavy N3 traffic volumes from the streets of Belturbet in time for the Festival of the Erne taking place in the town this August bank holiday weekend. It will also accommodate the large crowds travelling from West Cavan and Donegal to Croke Park this Sunday 4th August. Minister for Transport, Tourism & Sport Leo Varadkar described the early sectional opening as very positive for both road users and tourists alike. “Today’s opening will improve road safety and assist with local and regional economic development. 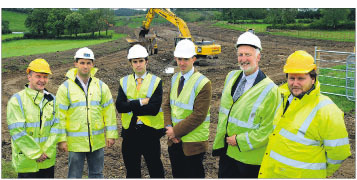 I look forward to the full completion early next year,” Minister Varadkar said.